The idea might sound too innovative for a conservative company like Microsoft but it is true that you will be able to use the new Windows 8 Operating System not only through your hard disk but also your pen or thumb drive. 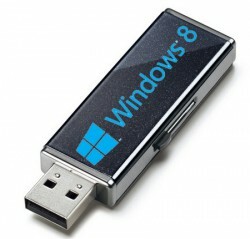 Very recently, officials from Microsoft demonstrated a feature of Windows 8 named “Windows to go” that lets you to store the whole Windows 8 operating system in a pen drive and also run the operating system through the pen drive in any computer. Through this feature, the users will be able to store all their applications, documents in pen drive of 32 GB and use any of them on any PC like their very own desktop. This is indeed a great feature which will provide the users a great deal of freedom and convenience. Although “Windows to go” is a surprise from Microsoft, there are many other OS that can also boot from a pen drive. These are usually based on open source platform such as Ubuntu from Linux and they are mostly known as Distros. However, each of them had their own issues with such operating system on a stick since they lacked a number of features and applications in them. With the “Windows to Go”, Microsoft aims to fulfill this market gap and keep the clients loyal to them. According to the tech gurus, “Windows to go” can boot on any computer including older ones as well where it will install drivers for that particular hardware without any reboots. This version has a smart system to ensure data security and safety where it will pause all its operations at the removal of the pen drive. It will go for a complete shut down if the pen drive isn’t reinserted in the PC within one minute. This has been successfully tested on both USB 2.0 and USB 3.0 port connections and it also supports legacy BIOS and UEFI firmware. Microsoft has already distributed a number of those “Windows to go” in a 32 GB pen drive in one of their build conferences and pretty soon they will be available to everyone. So keep waiting for this amazing Windows to go in a pen drive. Wow, Windows on a USB memory stick. Isn’t that amazing. Interested in learning more about the upcoming version of Windows? Contact us today and we can sit down with you and go through all the new features in Windows 8. As your Microsoft Partner we are committed to ensuring your business IT needs are taken care of.